The Varied Thrush (Ixoreus naevius) is a casual winter straggler (Vagrant) from the Northwest. 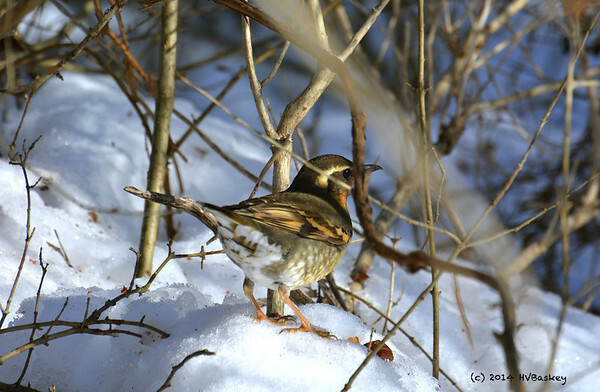 This particular bird, a mature female was reported seen at the Guelph Nature Centre (Conservation Area) a few weeks ago (original sighting by Andrew Bailey on 03 Feb 2014). Continuing sightings were posted on eBird and my curiousity and desire to see this vagrant got the better of me and off I went to search for the ONE bird in a lot of brush! I wasn’t sure what to expect, would she make an appearance for this curious Birder? Well? not only did I spot this beauty today, she put on a fabulous show for “patient” birders who were willing to stand there in the cold winter month of February at the north end of the dam, until she naturally came out of the brush to feed on crabapples and buckthorn berries. I am over the moon with her appearance and the photos that I was able to take of this rare vagrant visiting Ontario. I have to note that I am disappointed with people going into the brush to go find her. She is most willing to make a “natural” appearance, if you stand quietly and wait long enough. It’s a very small habitat that she has claimed and she does make regular appearances as she feeds on the berries. A delightful and very pretty bird! As I was even more curious of why such a bird would fly from a comfortable environment of the Northwest to a cold, bitter winter of Ontario – I dug around on line to find out about the habits of this special vagrant. 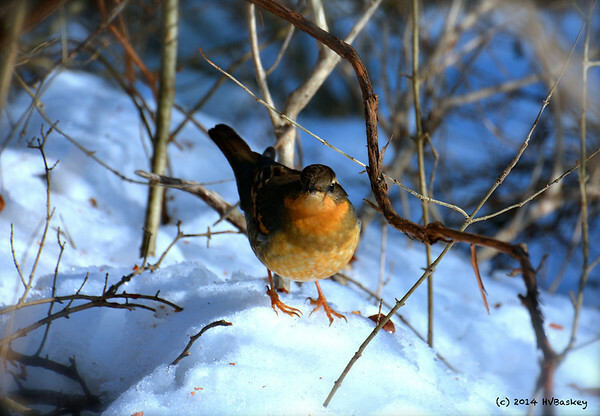 For additional information on the Varied Thrush and its vagrant habits (and more!) – please click on the link below for an easy-read article from Cornell Lab of Ornithology Publications. It is an older article (1996), but never the less – interesting! Wells J. V. and Rosneberg K.V. 1997. 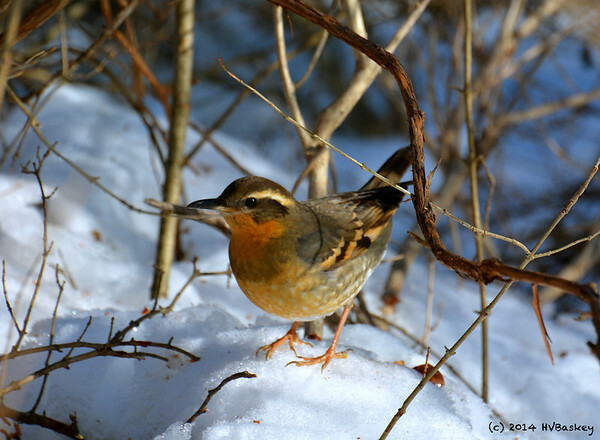 The Rise and Fall of the Varied Thrush. Birdscope, Spring 1996, Volume 10, Number 2: 1-2.